There’s just something calming and relaxing about sitting out in a screened-in porch on a warm summer night. If you’re from anywhere in the south, or like me and from the Eastern Shore of Maryland or Virginia where it’s quite rural, you know there’s something almost magical and totally peaceful about the stillness of a country summer night. while the mosquitos stayed outside. I can still see the white-flowered bushes surrounding that porch, with the huge carpenter bees and hummingbirds dipping their tongues in the tiny trumpet shaped blooms to get a taste of sweet nectar. The rows of sweet corn in Mom’s field, their stalks slightly swaying in the gentle evening breeze. And those beautiful clear night skies, sprinkled with stars surrounding a sometimes huge full summer moon which lit up everything around us. But one of the best parts of relaxing out on that porch in the summer was the symphony of sound and light we experienced on the warmest of those nights; a symphony you just don’t get when living in the city. Even on the stillest of evenings, we’d be treated to the simple pleasures of chirping crickets and croaking frogs. They’d start off “singing” with just a few soloists at a time, and within a few minutes, the soloists would be joined by a larger chorus which would have made any musician proud. My mother used to say the frogs were croaking for rain, and she was usually right. The funny thing is, though, I never really saw the entire chorus, just a few scattered participants here and there, and usually only after the performance was over. I still wonder where they all met to present their performance, and if they ever got together to practice before those performances! And the light shows, although not the spectacular displays of colorful neon and video walls we see at concert venues today, were simple but elegant, choreographed by an unseen Master, just for our delight. 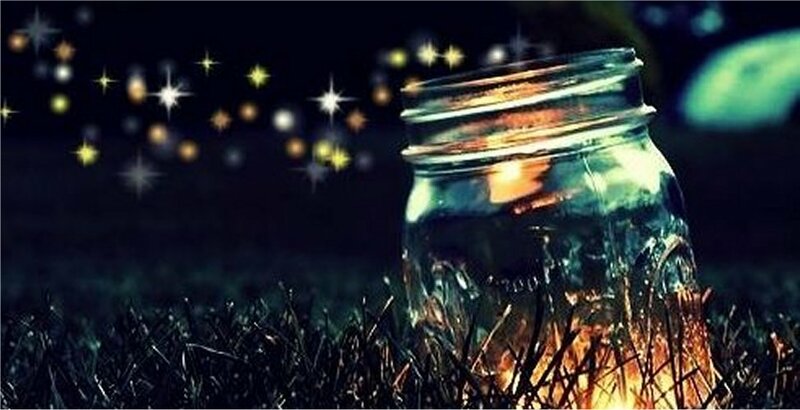 It would start out with an occasional lightning bug or two, and as twilight deepened into night, the few would become hundreds, their little lights glowing and moving through the night sky as they silently flew around from place to place. It was almost as if they were dancing to an unheard melody, delighting us children, and silently calling us to join them, as we wondered why their lights never stopped blinking, and where they went after the show was over. That is, the ones we didn’t catch in jars and take inside with us. And the sunsets were often amazing, with pink, red, and sometimes purple skies which didn’t last nearly long enough to fully appreciate. On the hottest of summer nights we could also be treated to a show of heat lightning, with the southern sky filled with occasional bolts of thin silent white lightning, or bursts of bright light which perfectly outlined the trees in the distance and lit up the occasional clouds. I’m sure I didn’t appreciate the beauty of it all then, like I do now. And now those lights can only be seen in my memories. As children, and even young adults, we most often do not appreciate the simple beauty of nature around us. God has blessed us with spectacular and wonderful bits of creation, if we only take a good look around us. I didn’t appreciate the beauty nearly enough when I was experiencing it. I didn’t realize what a marvelous show He was giving us for free; the Master artist and choreographer most certainly delights in displaying His handiwork, and presents it to us absolutely free of charge. All we need to do is watch. Now another family is living in that house that was once my mother’s, and having the experience of enjoying that wonderful symphony and spectacular light show that I only see in my memories. Most likely the great grandchildren of those crickets and frogs are singing a similar melody from the past, while other descendants of those long ago lightning bugs still dart around the yard in similar patterns from their ancestors. Sometimes when it’s quiet at night and I’m sitting out on our own back porch I can close my eyes and imagine I’m once again back on that wonderful porch at my mother’s. This year I’m even being treated to solos and sometimes duets or even small choruses of croaking frogs, led by a bullfrog we’ve affectionately named Jeremiah. It isn’t quite the same, but the Master conductor is still leading His chorus for all of us to enjoy, just in a different theatre with different scenery. Go outside this evening and enjoy a special performance of nature orchestrated by the Master conductor. Most likely it’ll be different from the one we’re enjoying, but it’ll be one created just for your own personal enjoyment! And then let us know what your special performance was like! Next What Are You Afraid Of?